The 2 ideas do not seem possible to coexist. Skyscrapers are built on a patch of land devoid of trees. These structures tower over the land at ever dizzying heights where no species of tree is able to reach. Not to mention that tree roots are an enemy to concrete foundations. We have long accepted that trees and tall buildings are not equal. If any trees are permitted in urban design, they are an accessory to the overall aesthetic, not part of the main event. This separation of nature and urban architecture has been the norm for a long time. Most major cities around the world have a plethora of monolithic structures in the downtown core and nature only creeps in through parks and other civic planning measures which confine the space allowed for stuff to grow. However, some cities are breaking with this traditional view of urban design norms. 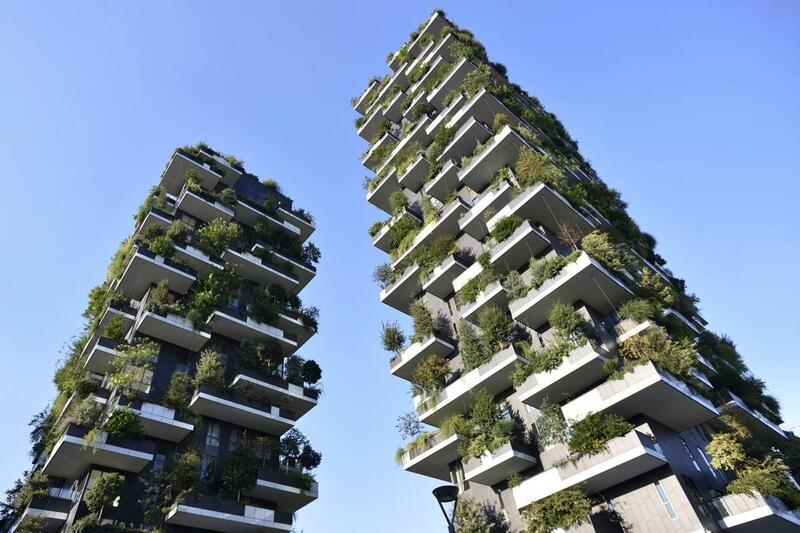 In Milan, buildings are being created with trees growing from balconies on all 4 sides and on every floor. Along with various other plants, when the area comes into full green in the summer time, much of the concrete surface disappears. In the fall, when the plants are changing their colours, the scene changes again. Designed by architect Stefano Boeri, the Milan vertical forests concept has proven so popular that similar projects have been commissioned for Lausanne in Switzerland, Utrecht in the Netherlands, and the Chinese cities of Nanjing and Liuzhou. Can you imagine living in such an amazing urban space? Looking out each morning, with a cup of water, coffee or tea in hand and starting your day with this kind of energy all around you? Not to mention the myriad of other benefits. Other cities are using massive rooftop square footage to create impressive gardens, which change the skyline from a glaring plain of roofing material to a pleasing natural space, containing every shade of green imaginable. 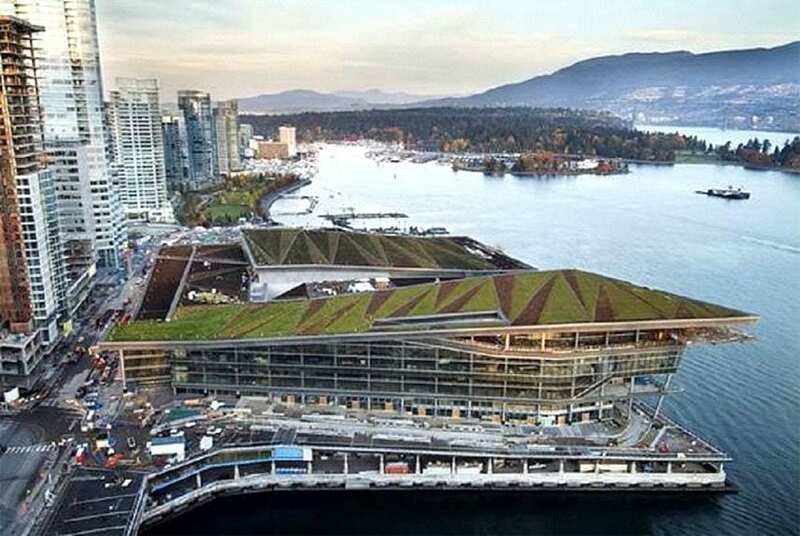 This view of the Vancouver convention centre and the large urban refuge of Stanley Park and the north shore mountains in the distance, helps give residents a wonderful place to call home. In Cairo, Egypt a project is nearing completion which includes an apartment, retail, and office complex with an abundance of greenery which the designers call “mega-trees.” Eight buildings will intertwine to form the complex. The top floors will be connected by pedestrian bridges, and offer playgrounds and small gardens growing fruit and vegetables. This futuristic project uses mega-trees to power apartments. An incredible and much-needed innovation in building design. The question for some is, why bother? Seems like a whole lot of extra effort and expense for what kind of return on the investment? The argument could be made, keep it simple. Devote some pieces of land to parks and the rest to concrete. Anyone can go to the parks if they want. Historically, that is the theory which has held sway for most city planning around the world. Problem is, not enough land can be devoted to the amount of green space we really need. Humans desire it, birds, animals and insects must have it and yet cities are continually gobbling up land and converting it to spaces only moderately inhabitable. The irony in all this is, people need green space much more than they realize. Research is finally being done to show that we need green spaces in our lives for a host of reasons. Tree People, an organization which inspires and supports the people of LA to come together to plant and care for trees, harvest the rain, and renew depleted landscapes, published a list of 22 top benefits of trees. Not scientific enough? OK, how about a report called, Neighborhood greenspace and health in a large urban center, examining the associations between comprehensive greenspace metrics and health. While it is true that money can’t buy happiness, that statement does not apply to people below a certain income line. For much of the world’s urban population, a quality of life increase valued at $10,000, could be significant. For what the study looks at is people’s perception of their health and happiness in relation to the number of trees in proximity to where they live. There is no downside to surrounding people in cities with more trees and other green spaces to enjoy. There are so many ways in which this kind of urban re-design is a good thing. The least important reason is, it looks nice. If there are discernible health improvements and building energy cost savings, all the better. Improving the quality of life for residents is icing on the cake. I think the other benefit which could be realized is that when people are more closely connected to nature, they are more likely to want to preserve it. The evidence is all around us. The benefits are clear. There is no reason to stay the course and continue as we have always done. The only roadblock may be cash. It is not even that the solutions are necessarily expensive in new construction. The problem really is, what to do about all the downtown centres which are already built around the world? It is not logistically or financially practical to renovate everything. But the worry for what is already done and converting everything to a new, better model is perfectionist thinking. If I can’t have this wonderful concept in all my downtown buildings then I’m not going to bother starting at all. That kind of thinking is what has landed us in this mess in the first place. While some of the studies are recent, I think we knew, at some level that providing green space to people living in a concrete jungle is a good thing. All a person needs to do is take a walk in the woods to know, you feel better for doing so. No study was needed for that. It is common sense. Now its time to start doing the right thing. As many projects already underway or completed around the world have shown, it is possible. “We hope that [these] results show how nature isn’t just a nice thing to have – although it has a huge value in itself – it’s fundamentally important for our health, wellbeing and happiness and that ought to be reflected in our education system, in the way we treat the physically or mentally ill, in the way we build infrastructure and houses and in how we access and protect green spaces in cities.